Even if you're not planning on taking your smartphone onto the slope, you'll want to keep it handy to take advantage of all the great winter sports apps out there that can help track your progress, as well as measure your speed and distance. You can then share all your greatest (er...and worst!) stats and photos with your friends. Here's our list of the top apps to download. Ski School are a series of Apps to improve your skiing technique and move from beginner to advanced. Use before you hit the slopes or in between as some extra practice. For iPhone, iPod Touch and iPad and it's available from the iPhone App store. Available on Android, XC Ski School has been created by a ski instructor for 20 years, Emily Wexler. The App include 21 videos, with the first ten available for free. Videos are downloaded rather than streamed so you can watch them even without a connection. With this App you can download trail maps to your phone and navigate them using GPS, and even let your friends know where you are on the mountain. You can also hook into webcams of the places you'll be skiing, just to get the heads up before you arrive! The latest version even allows you to create graphs of your speed and vertical drop, and then share them. It covers most of the major ski resorts of Europe and North America. 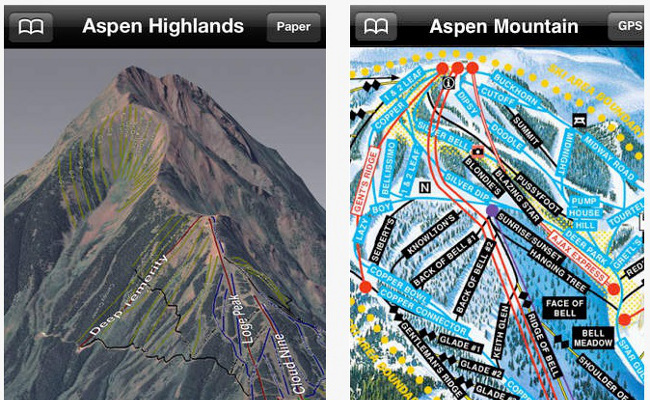 Ski Maps are available to download at the iPhone App store. The Android alternative, Ski Trail Maps, this gives you unlimited instant access to over 1,000 trail maps from all around the world, which you can download and view later. Like Ski Maps, there are also options for resort webcams, weather forecasts and a snow report. For some of these features you'll be prompted to upgrade to Ski TrailMaps Pro once your trial has expired. Completely free, The Snow Report App is from the Ski Club of Great Britain, and provides information on on and off piste conditions, snow depth, live weather updates and live webcams from the slopes from over 250 destinations. On the Snow Magazine have their own version for Android, The Ski and Snow Report. This App brings you the current snow condition reports at more than 2000 ski areas around the world, as well as first-hand ski reports from fellow skiers. This app will help you asses your local avalanche risk. Mammut Safety has a clinometer to estimate the angle of a slope, as well as a compass and an altimeter which are tools to help you work out the safety of a particular slope. Granted, you will need to know how to use them, but if you are skiing off piste an avalanche course is recommended, and this will take you through the use of tools like this. You'll also get avalanche bulletins from around the world. It also comes with an emergency tracker and contact system that can send your coordinates to the emergency services. FitClimb has many of the same tools, as well as Avalanche Safety Videos that take your through avalanche safety and survival. This app will need reception or internet connection. Read our guide for more information on how to avoid and survive an avalanche. This App covers over 750 resorts and can help you locate ski lifts or particular slopes. Itrail Maps also has a 3D version for iPhone and you can record distance skied or walked etc. BackCountry Navigator is an Android alternative that allows you to download maps for offline outdoor navigation. This allows you to use your phone with gloves on by shaking it instead of pressing buttons. Ski Phone is perfect for ski slopes but pretty handy all round for anyone going through a British winter and feeling frustrated every time they need to take their gloves off to use their phone's camera. For Android. If you're into turns, this is the App for you. The developers of Snow Edge have created something called a Turn Acceleration Index (TAI) which tracks your tums. All you need to do is leave your phone switched on in your pocket, although a call or message may mean you have to restart the programme. For Iphone. Alpine Replay measures your speed, vertical, jumps, Calories, and more, on any mountain. You can track, compare, and share with anyone in the world for free.You can Get a basic set of stats right on the slope and later log into AlpineReplay.com to see your progress over the season, compare with friends, push your stats to Facebook, and Replay your runs in 3D. This App finds your current altitude, both by measuring your current elevation above sea level using your GPS, and cross checking this against the United States Geological Survey's massive worldwide elevation data source. If you are feeling curious you can also check into almost anywhere on earth to find its altitude, possibly inspiring a number of "I'm higher than you" messages to your fellow boarders and skiers at other resorts around the world. Download Elevation Pro for Iphone and Ipod touch. Get Attitude purports to be even more accurate than GPS altitude and was developed in Austria, in the heart of the Alps.